Join us for our Annual Police Department Open House. The event is tomorrow, Saturday, June, 16th from 11:00 am to 3:00 pm. 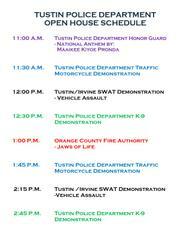 There will be games, food, and demonstrations by our motors, canine, S.W.A.T., and the fire department (see attached photo for demonstration schedule). Everyone is invited to attend this event. Visit with our various police units and our personnel. Do not miss a chance to learn more about the people who protect our City. Enjoy a free hot dog lunch. Bounce houses and face painting will be part of the event. This event is free and lots of fun for the entire family!